Japan's space agency (JAXA) successfully landed two robotic rovers on the asteroid 162173 Ryugu on Sept. 21, marking the first human-made robots to land, move autonomously on an asteroid surface and capture pictures. 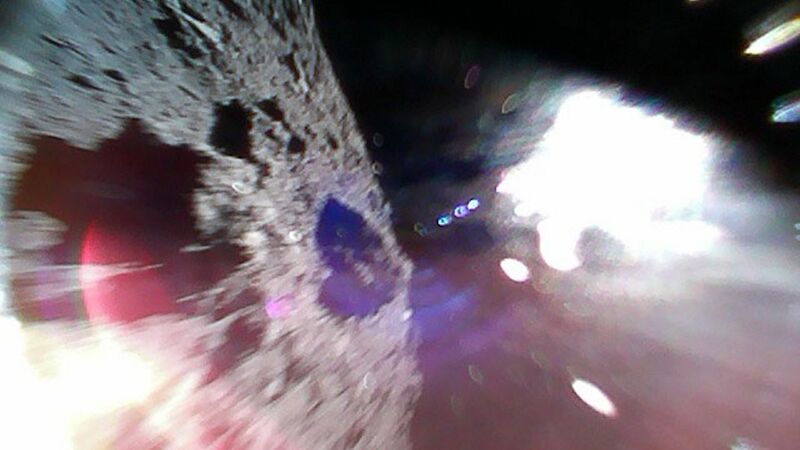 Why it matters: The two MINERVA-II1 rovers are part of Japan's ambitious project to learn more about asteroids by deploying various robotic crafts, known as the Hayabusa2 Project. The history: The success of these rovers comes 13 years after the first Hayabusa mission failed to successfully deploy its mini-lander, known as MINERVA. What they're saying: "I cannot find words to express how happy I am that we were able to realize mobile exploration on the surface of an asteroid," says Yuichi Tsuda, Hayabusa2 project manager, in a statement. "I am proud that Hayabusa2 was able to contribute to the creation of this technology for a new method of space exploration by surface movement on small bodies." "I was so moved to see these small rovers successfully explore an asteroid surface because we could not achieve this at the time of Hayabusa, 13 years ago." What's next: The two MINERVA-II1 rovers have cameras on board that can shoot in color, and they have already sent pictures back to Earth. Rover-1A and Rover-1B have been taking pictures as they hop around on the asteroid's surface, but they're not the culmination of the mission. Still to come are the deployment of two other vehicles that will study other details of the asteroid — with the goal of gathering asteroid samples to eventually return them to Earth. Go deeper: The website of the JAXA Hayabusa2 Project.